The opening of the Atrioventricular Valves allows the flow of blood from the Atrium to the Ventricles, this happens when the Ventricle pressure is lower than the Atrial pressure. This occurs when the Ventricles, Papillary muscles, and the Chordae Tendineae are relaxed. The closing of the Atrioventricular Valves prevents the back-flow of blood to the Atrium during Ventricular contraction. This occurs when the Ventricular pressure is greater than the Atrial pressure, causing the leaves in the valve to close. 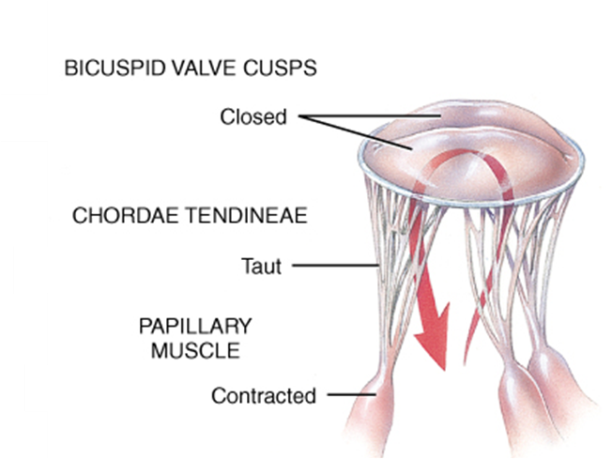 This occurs when the Chordae Tendineae are stretched, the Papillary muscles contract and pull the chordae (cables) that prevent the cusps from inverting. Semilunar Valves open when the Ventricles are contracted to allow blood to flow to the Lungs (right side) and Aorta (left side). The Semilunar Valves are closed during Ventricular relaxation to prevent back-flow of blood to the Ventricles. This occurs when the blood begins to return to the Ventricles as a result of vascular resistance and the filling of the Valve leaves until they are closed.